@ShineWrestling's SHINE 15 Results, Bombshell Ladies Of Wrestling Results, WWE:TLC Fallout, Total Divas & the latest in NXT, @CombatZone's Cage Of Death Results, @LCWRoses debuts in January, Joshi News: Arisa Nakajima regains JWP Openweight Championship, Nakajima vs Io Shirai Unification has been set, STARDOM matches announced for December 29th, Kana vs Meiko Satomura IV, DIANA, @The RealKaseyRay wins Chaotic Wrestling Women's Championship, Upcoming events, Results & More. Follow me @Ciara92189 on Twitter. Back at SHINE 14, Allysin Kay left with Jessicka Havok after coming up short against the Global Green Gangsters for the SHIMMER Tag Team Championship with Ivelisse as her partner, it looked that Kay had severed ties with The Valkyrie and reconciled with Havok, but things turned for the worst. Later in the night, Kay appeared in Havok's corner for the Last Woman Standing Match against "Sweet" Saraya Knight, Kay's "supportive role" would ultimately be Havok's undoing, leading to the referee to make the ten-count on Havok as Knight escaped with the victory and bragging rights over Havok. On Friday, their confrontation would end in a double disqualification as both competitors assaulted the referee. Even though the contest ended with either competitor's hand being held up, this rivalry is just getting started and will continue into 2014. The S-N-S Express of Jessie Belle and Sassy Stephie challenged Amber O'Neal and Santana Garrett of The American Sweethearts to Losers Must Break Up Match in which the losing team would must disband. Back at SHINE 13, the S-N-S Express pulled an upset over Garrett and O'Neal and assisted Nevaeh in a victory over Leva Bates. This lead to all six competitors pairing off at SHINE 14, with the Sassy Stephie getting the Kiss My Sass on Garrett. At SHINE 15, Stephie would once again get the Kiss My Sass on Garrett as she missed the Shining Star Press, with Jessie Belle taking the pinfall, as a result the American Sweethearts are forced to disband. Also, the SHINE Championship was on the line as Rain, the reigning and defending champion took on Amazing Kong in what was supposed to be Rain's final match as an active competitor in professional wrestling as she would be retiring that night with or without the title. Rain retained against Kong via count out as The Valkyrie brought out a beaten-up Solo Darling as distraction. Afterwards, Rain declared that she is NOT retiring, which brought about Lexie Fyfe. Fyfe announced that Rain's next title defense will be against Ivelisse at SHINE 16. Thoughts-Solo Darling and Su Yung clashed in a rematch from SHINE 14, that featured Darling going over Yung. At SHINE 15, Yung made Darling tap out to the Yellow Fever. Leva Bates and Nevaeh faced off in a Friday the 13th Massacre Match. Bates finished Nevaeh with three Superhero Kicks for the win. Sassy Stephie and Jessie Belle distracted Bates post match, with Nevaeh taking the opportunity to attack Bates from behind. This brought about the All American Sweethearts to make the save, prompting their match against S-N-S Express to start. Ivelisse defeated Mia Yim with a top rope Code Red. If youre familiar with their previous matches, this did not disappoint. Yim and Velez have the ability to intertwine their styles into one another, making for an explosive encounter. The rest of the under card featured interesting pairings, for starters Taylor Made made her long awaited return to the promotion after a four-month absence, Made opted to not participate in the SHINE Championship Tournament at SHINE 11 in protest for Allysin Kay's 90 day suspension from the promotion. Made's return came against Angelina Love. Since her debut, Love has had her endeavors with The Valkyrie, even challenging the defacto leader back at SHINE 13 for the title. Taylor Made came close to walking away with the "W" in her return, with an O'Connor roll on Love for a near fall, but Angelina Love prevailed with the Botox Injection for the three count, despite the failed interference from Allysin Kay. Mercedes Martinez took on Heidi Lovelace. Martinez got the near fall on Lovelace twice before getting the Fisherman Buster following Lovelace's missed Frog Splash. In all honesty, Lovelace has proved to be a decent hand in the ring over the past year and should have been paired with an up and comer like herself. Instead Mercedes Martinez picks up another victory, which in no shape or form is tied in with her rivalry with Daffney's All Star Squad unless Lovelace is the newest recruit. But again, this storyline was to followed up on SHINE 15, taking in account that Nikki Roxx just retired and Daffney's absence from the event. And Sojo Bolt defeated La Rosa Negra with the Total Darkness. Seldom appearing for the promotion, Bolt picked up her second singles victory, whereas Rosa Negra has been unsuccessful in all three of her SHINE appearances, hopefully this changes. SHINE 16 will be on January 24th via WWNLive with Serena Deeb making her debut, despite the numerous technical difficulties the show on Friday endured. ►Candice LeRae will be challenging Christina Von Eerie for the Alternative Wrestling Show Women's Championship at "No More Presents For Christmas" on December 28th. ►Kasey Ray become the new Chaotic Wrestling Women's Champion on Friday night. Defeating Davienne, Mistress Belmont and Alexxis Nevaeh in a four-way for the championship, this marks Ray's first championship. ►Bombshell Ladies Of Wrestling made it's debut in Avenel, New Jersey on Saturday. Coming off back-to-back tapings in July and an additional show in September, Pro Wrestling Syndicate's all-women promotion would be commemorating it's first full year in business, which featured the tournament for the Bombshells Championship kicking off on it's debut show on October 11th with Becky Bayless, Brittney Savage, Annie Social, Christina Von Eerie, Missy Sampson, Sienna DuVall, Sumie Sakai, and Marti Belle advancing to the next round, the tournament concluded on February 9th with Sampson taking the championship. The championship changed hands on May 11th and continued to stay within the grasp of La Rosa Negra. Compiled for the eighth edition of Bombshells, Missy Sampson would collide with La Rosa Negra for the Bombshells Championship once again, this time in a Best Of Three Falls Match, which was dubbed as Sampson's final shot. Crowned as the inaugural Bombshells Champion back on February 9th by way of defeating Sumie Sakai, Katarina Leigh and Sienna DuVall in the finals, Missy Sampson would go onto losing her championship just mere moments after making her first title defense against Mickie Knuckles, as La Rosa Negra became the new champion through the "controversial" referee stoppage. It turned out the decision to dethrone Sampson of the title came at the hands of Commissioner Vinny Finucci with referee Kevin Keenan handling the decision, which is chronicled here and here. Come September 28th, Sampson and Annie Social, reprised their role as the "Backseat Girlz" and defeated Amazing Kong and La Rosa Negra as Sampson picked up both pinfalls in the Elimination Tag Team Match to land another shot at the championship. On Saturday, Sampson regained the title "she never lost." Also, Jennifer Cruz and her cousin, Amber Rodriguez would meet in a Street Fight. The turmoil between the relatives kickstarted back at the double set of tapings in July, as Cruz and Rodriguez came up short against the Backseat Girlz. Rodriguez berated Cruz for her effort and hand her beating with the likes of Jessie Kaye and Alexxis Nevaeh joining in. All three attacked Mistress Belmont and Veda Scott after their singles contest, Cruz made the save for Belmont and Scott in effort to even the odds with a kendo stick in hand. And from there Strength In Numbers was born. In September, the family rivalry was scheduled to take place in the ring, but Amber Rodriguez decided that Cruz would have to go through another opponent before she gets to her. Rodriguez interfered in Cruz's match against Vanity, Rodriguez distracted the referee as Vanity grabbed hold of the kendo stick, striking Cruz to follow through with the rollup. Belmont and Scott made the save for Cruz as she suffered a beatdown from Rodriguez and Kaye. On Saturday, Rodriguez defeated Cruz. There would be a tournament to crown the first ever Majestic Champion, as Mia Yim, Sienna DuVall, Alexxis Nevaeh, Mistress Belmont, Annie Social, Hania the Howling Huntress, Sumie Sakai, Niya, "Primetime" Amy Lee, Vanity, Angel Dust and Jessie Kaye would be the participants in the Majestic Twelve Tournament. The first round of the tournament would feature the teams of Alexxis Nevaeh and Mia Yim, Jessie Kaye and Sienna DuVall and La Rosa Negra and Grandma Butcher taking on their respective opponents in Niya and Hania, Angel Dust and Vanity and Annie Social and Sumie Sakai with the winners facing off with their partners in singles competition in the second round of the tournament, that being Mia Yim going over Alexxis Nevaeh, La Rosa Negra defeating Butcher and Jessie Kaye besting DuVall. The third round featured the winners of the previous round facing off in a Triple Threat Elimination Match, as La Rosa Negra defeated Mia Yim and Jessie Kaye in the finals to become the inaugural Majestic Champion. La Rosa Negra's title win has landed her another shot at the Bombshells Championship come February 22nd in Rahway, New Jersey, as she, Angelina Love and the debuting Mickie James will challenge Sampson in a four-way. ►Kacee Carlisle's next challenger to her NWA World Women’s Championship will be Jessie Belle on January 4th for NWA Smoky Mountain. ►Leicester Championship Wrestling Roses is set to make it's debut on January 25th in Enderby, Leicester. An off-shoot of Leicester Championship Wrestling, "Roses Rumble" will be packaged with the likes of Rhia O'Reilly, Nikki Storm, Shauna Shay, Kay Lee Ray, Felony, the recently relocated Addy Starr, Pollyanna Peppers, Viper, Violet Vendetta, Erin Angel, Princess Nadia Sapphire, Jenna and Carmel Jacob and more participants for the debut, which will be headlined by the Roses Rumble Match in the main event of the show. Besides the Roses Rumble, matches for the undercard have been announced. First up, Rhia O'Reilly will be taking on the "All American Canadian" Addy Starr in an International Encounter. There will be tag team action as Viper and Jenna take on the "Pin-Up Princesses" in Nadia Sapphire and Violet Vendetta. Shauna Shay will take on Carmel Jacon and Nikki Storm will also be in singles competition with an opponent to soon be announced. Danni Hunter defeated Viper in the decision match for the vacated FutureShock Wrestling Women's Championship on Saturday. April Davids was stripped of the championship back in November due to lack of title defenses. Kay Lee Ray, Pollyanna Peppers and Rhia O'Reilly will collide in a three-way match for Tidal Championship Wrestling's "Wipe Out!" on February 9th in a British Bombshells showcase. ►Starr captured the NWA Top Of Texas Women's Championship for a third time on Saturday, defeating Paula Fate with a Sitout Powerbomb. ►Jillian Hall and Leah Von Dutch have been announced for Xtreme Bombshells Of Wrestling on February 9th, with the women colliding in a Steel Cage Match for the XBW Championship. ►And the WWE Divas Championship remains in the possession of AJ Lee. On Sunday, Lee's championship was on the line against the often referred to "muscle" of the Total Divas in Natalya for WWE's TLC. Continuing with Lee's crusade against the cast of Total Divas, Natalya became the next member of the cast to challenge Lee head on for the championship. After going over Brie Bella at back-to-back PPVs, the champion awaited another challenge from the Total Divas. Back at Survivor Series, Natalya and Nikki Bella were the sole survivors of the Total Divas vs "True" Divas match up with the third generation Diva getting the Sharpshooter on Lee for the win. Aside from their encounter at Night Of Champions for the championship, Natalya and Lee had not met in the ring in one-on-one capacity since the November 13th episode of Main Event in which Natalya got the win via disqualification. Two wins over the champion and Natalya found herself as number one contender for the championship. Michael Cole mentioned on commentary that this was Natalya's first singles match for the Divas Championship on PPV in three years, making her last for Surviror Series in 2011 when she defeated Michelle McCool and Layla for the championship in a Two On One Handicap Match. That inkling made it more precedent that the title was about to change hands, as many assumed that Lee's actions against Michelle Beadle at the Tribute To The Troops tapings had landed the champion in "deep" with WWE officials as her championship would be handed to Natalya as "punishment." After missing the flying clothesline, Lee escaped Natalya's scoop slam attempt, turning into the guillotine choke. From there Natalya reversed the submission, but Lee utilised her quickness and tried for a rollup with Natalya rolling through with a dropkick to the face. Natalya leveled Lee with clotheslines and suplexes before Natalya got the sitout scoop slam and followed up with the Sharpshooter. Lee desperately crawled to the bottom rope, but Natalya pulled her back into the center of the ring. Tamina Snuka distracted Natalya as Lee locked in the Black Widow in hopes of submitting Natalya, instead Natalya was able to break the hold and Lee found herself getting wrapped up into the Sharpshooter again. Realizing that her Divas Championship could possibly end up around the waist of a "Total Diva," Lee grabbed a handful of Natalya's hair and rolled her up for the win. Unless WWE is set to run another program with Brie Bella taking on Lee, this storyline has wanned and currently preserves little interest to continue as Lee taking on seven women, two of which dont have enough ring experience to be viable of a challenge, the Funkadactyls are "too busy" with their own endeavors with Brodus Clay's apparent heel turn, that leaves Nikki Bella as the next possibility. On Monday Night RAW, Nikki Bella came close to putting the champion away with her recently adopted , but Snuka blindsided her with a Superkick with Lee catching Nikki with the Shining Wizard for the win. Nikki and Brie received the Diva Of the Year Slammy the week previous, with many professional wrestling fans objecting to the choice, citing that AJ Lee deserved the award. Either way this gives Lee another reason to continue her meddling with the Bellas, though the "pay-off" to this feud is not for certain. Recent NXT signees Leah Van Damme and Ashley Sebera have revealed their official NXT names, Van Damme will be referred to "Carmella" while Sebera is officially "Dana Brooke." @KingJBrand's NXT In A Nutshell: In recent weeks we've seen the captivating Russian ambassador to the Bulgarian Brute known as Alexander Rusev make her presence felt. Lana, the conservatively dressed, multilingual blonde seems to be the only person to tame such an uncontrollable monster. She simply introduces her charge, lets him lay a path of destruction(which has run through men like Colin Cassady, Sylvester Lefort, and Kassius Ohno) and tells him when he's dealt enough punishment. Lana's role as a manager, rather than as a wrestler affords her to grow as a minor character to a much more major one in Rusev, it also allows her to grow as a mouthpiece and not just eyecandy. The pairing of Rusev and Lana presents NXT with its first power couple and it will be interesting to see how far they get in the coming weeks. Still reeling from the sudden betrayl of her alleged "best friend" Charlotte, Bayley challenged her two biggest detractors, Summer Rae and Sasha Banks aka The BFFs to a tag team match with her "true" friend and mystery tag team partner, Natalya. Though putting up a valiant effort Bayley's team would succumb to Sasha's Bankrupt. While Emma has been rarely seen since being attacked by the BFFs offscreen a few weeks back and Paige has gone off on an angry spell of distrust of women normally on her side, Bayley the ever lovable fangirl has seemingly won over the NXT Universe and carved a niche for herself as one of the top babyfaces in NXT male or female. Natalya herself has had a bust number of weeks on NXT. After questioning the attitude problem of current NXT Women's Champion Paige, the two wanted to return to their roots so to speak and the following week had a true wrestling clinic of a match. Following the bout, Paige has seemed to calm down and refocus on being Women's Champion. Although Natalya's role on NXT the past few weeks is unclear, she has added a sort of level headed medium to the various conflicting entities that make up the NXT women's division. Madison Rayne made her return to TNA on last week's Impact Wrestling. Taking out Gail Kim with the Spear and Lei'D Tapa, Madison Rayne looks to have turned babyface. Rayne's absence from the company was due to pregnacy, with the current roster of Knockouts narrowing down, Rayne's reappearance had the "its about time" feel. Though Rayne coming in on ODB's behalf is somewhat different, given that Rayne has not been "babyface" since her debut in the promotion back in 2009. Its interesting. Rayne and ODB will take on Gail Kim and Lei'D Tapa for Final Resolution tonight. The previous week featured Gail Kim's Open Challenge continue as Cherry Bomb, going under her birth name "Laura Dennis" answered Kim's challenge. The December 5th episode featured the Toronto, Ontario, Canada native coming up short against the Knockouts Champion's Eat Defeat. Like previous challenger Candice LeRae, Cherry Bomb is a eight-year veteran on the independent scene. Starting out back in 2005, Bomb regularly appeared for promotions in Canada before making her way to the United States, to this day she splits time wrestling in both countries. Bomb is currently affiliated with Combat Zone Wrestling as she and husband, Pepper Parks are well "received" by the fans, and has participated in cross-promotion matches for Women Superstars Uncensored and is a regular for nCw Femmes Fatales, SHIMMER Women Athletes and has a couple of tours of Japan to boot. ►Jasmin's Pure Wrestling Association Women's Championship will be on the line against Beautiful Beaa on January 18th at "Holiday Hangover." Jasmin unseated Beaa of the championship back on December 7th with Jasmin finishing Beaa with the Magic Carpet Ride. The upset spawned the rematch to take place in January. ►The American Joshi Championship will be on the line at Anarchy Championship Wrestling's "Guilty By Association 8" on January 19th as Su Yung's title defense will be up against Barbi Hayden. Also announced, Jessica James and Pierre Abernathy will meet in a Grudge Match. The ACW Tag Team Championship will also up for grabs as Angel Blue and Jojo Bravo of "The Business" defend against Paul London and Jack Jameson. ►Jewells Malone, Shane Sabre and Jesse Amato will collide at Deathproof Fight Club's "Declaration Of Anarchy" on January 12th with Amato's Young Blood Championship on the line. ►Veda Scott has issued an Open Challenge for Wrestling Is RESPECT's January 19th show. On Monday, the match between Io Shirai and Arisa Nakajima with the World of STARDOM Championship and the Openweight Championship on the line was made official for STARDOM's "Year End CLIMAX" on December 29th at the Korakuen Hall. After successfully retaining against Nanae Takahashi at STARDOM's one-hundredth show on November 4th, Shirai nominated Nakajima for a shot at the "red belt," but Nakajima wanted to regain the Openweight Championship before accepting the challenge, as both titles will be up for grabs in a unification match. In the end, one competitor will sit atop the food chain in both promotions, as one woman will be heading both promotions as the champion. 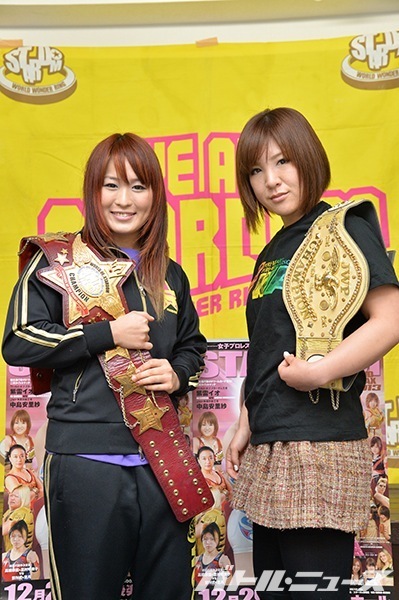 Also, DASH Chisako and Sendai Sachiko are the new JWP Tag Team & Daily Sports Women's Tag team Champions. The "Jumonji Sisters" defeated Leon and Ray in the decision match for the vacant titles on Sunday, with Chisako getting the Hurricanrana on Leon to become the 42nd JWP Tag Team Champions and 15th Daily Sports Women's Tag team Champions. Manami Katsu picked up her fourth title defense against Rydeen Hagane with the Orange Blossom. Hanako Nakamori defeated Takako Inoue with the Destiny Hammer. And Command Bolshoi, Kayoko Haruyama and Yako Fujigasaki defeated GAMI, Yumi Ohka and Natsuki Urabe. The 2014 Tag League the Best will begin on January 5th. So far the announced participants are Sachie Abe with Yako Fujigasaki and Hanako Nakamori and Takako Inoue. The aforementioned card for STARDOM on December 29th will be headlined by the unification match between Shirai and Nakajima, but will also feature three additional title matches. For starters, the High Speed Championship will be on the line as Kaori Yoneyama defends against Natsuki*Taiyo, Yoneyama is scheduled to defend the title against Yuhi on December 23rd. Secondly, Kellie Skater will be making her return to the promotion, challenging Act Yasukawa for the Wonder of STARDOM Championship. And lastly, the Artist of STARDOM Championship will also be contested for as Hiroyo Matsumoto, Miho Wakizawa and Mayu Iwatani will be challenging champions Kyoko Kimura, Alpha Female and Alpha Female. Takumi Iroha continues her ten match series, on December 23rd she takes on Alpha Female and on December 29th the 2013 Rookie Of STARDOM takes on the last year's winner in Yuhi. Nanae Takahahi and Meiko Satomura go against Yoshiko and Kagetsu and Kairi Hojo goes up against Koguma. Other Tidbits, Emi Sakura's IWA Triple Crown Championship will be on the line for Gatoh Move's December 27th show against Antonio Honda. Also slated for the card, Hiroyo Matsumoto takes on Sareee, Kaori Yoneyama takes on Tsubasa Kuragaki, Nanae Takahashi meets Sayaka Obihiro, Riho takes on Kotori and Miho Wakizawa and Hiroshi Fukuda will face off in a "song confrontation." KANA Pro will be presenting it's first show on February 25th, with the "World Famous" founder taking on Meiko Satomura in the main event. Arisa Nakajima and Ayako Hamada will be apart of the show, Nakajima and Juna Kasai will take on Hamada and a mystery partner. The first matches for Ice Ribbon's "RibbonMania" have been announced, the ICExInfinty Championship will be on the line as Tsukasa Fujimoto defends against former champion Maki Narumiya. Hikaru Shida will collide with Kagetsu and Miyako Matsumoto and Jun Kasai will take on Hamuko Hoshi and Kouzy. Neko Nitta picked up her third title defense as Triangle Ribbon Champion on December 11th against Matsumoto and Tsukasa Fujimoto. Tsukushi and Manami Toyota take on Kurumi and Kyoko Inoue with the winners receiving a shot at the International Ribbon Tag Team Championship on January 4th against Muscle Venus. Risa Sera and Rutsuko Yamaguchi take on Mio Shirai and Misaki Ohata.Also, GAMI's road to retirement continued as she had her final match in the promotion, with she and Hoshi going oer Risa Sera and Rutsuko Yamaguchi. GAMI will be appearing for Matsumoto's GAKE Pro on December 19th. Matches for OZ Academy's January 12th show have been announced, as Aja Kong and Dynamite Kansai will be taking on Mayumi Ozaki and Mio Shirai. And the OZ Openweight Championship will be on the line with AKINO defending against Sonoko Kato. Over in World Woman Pro Wrestling DIANA, Yumiko Hotta and Keiko Aono lost the WWWD World Tag Team Championship to Kyoko Inoue and Tomoko Watanabe on Sunday on third title defense with Watanabe getting the Screwdriver on Aono. It looks that Sumie Sakai will be returning to Japan soon, as she, Jessica James and "Crazy" Mary Dobson advertised for DIANA's April 29th flier. The show will be headlined by the WWWD Championship match between Yumiko Hotta and champion Kyoko Inoue. Ayumi Kurihara had the titanium plate removed from her clavicle recently. Kurihara had the plate inserted back in 2007 after a flying clothesline from Aoi Kizuki shattered her clavicle, forcing Kurihara to be sidelined the remainder of the year. The next Joshi4Hope show has been announced for March 9th. The fifth show will feature the SHIMMER Tag Team Championship on the line as Tomoka Nakagawa and "The Rate Tank" Kellie Skater will be defending their titles. ►Leah Von Dutch takes on "Girl Dynamite" Jennifer Blake for Conflict Wrestling on January 11th. ►Savannah Summers regained the Riot City Wrestling Women's Championship last Saturday. Summers defeated Izzy Shaw for the vacated title, as the then current champion, Eliza Sway, vacated the title and the IndyGurlz Australia Championship simultaneously due to injury. Back in 2012, Summers was crowned the inaugural RCW Women's Champion after defeating Miami in the finals of the tournament. Summers was slated to take on Kellyanne English, but travel issues permitted English's appearance and Summers was pitted against Shaw instead. Speaking of the IndyGurlz Australia Championship, the championship changed hands at New Horizon Pro Wrestling's "Final Conflict" back on November 29th, as "Sweet" Saraya Knight bested Madison Eagles for the title. Back on October 12th, Eagles defeated Kellie Skated in a decision match for the title, with the announcement of Eagles' first title defense coming against the debuting Saraya Knight, Madison Eagles refused to take the match. With Eagles' refusal, NHPW rebooked the contest with Knight taking on Skater instead, with the winner getting a shot at the title, all while Eagles' coronation as champion would be taking place. Knight went over Skater and Eagles lost the newly created IndyGurlz Australia Title in her first defense. In addition, NHPW has announced tht Knight will be returning to the promotion on May 17th and is the first competitor announced for the Global Conflict Women's Tournament that takes place on May 23rd-24th. The never-ending turmoil of the Impact Pro Wrestling Women's Championship concluded with a twist a week ago as Evie regained the championship. Evie, the first ever IPW Women's Champion, defeated Olivia Shaw and Britenay with the TTYL on Britenay to capture the championship for a second time, as Evie was stripped of the championship back in July after her title defense against Britenay and Shaw was declared a No Contest after interference from Megan-Kate. The title was then awarded to Emmy Driver by Mr. Wrigley, a complete unknown. Driver was scheduled to face Evie for the title at "Last Chance," but Driver fled from the match and the title was declared vacant once again. Things would change on December 7th as the now two-time champion would turn "heel" and formed The Investment with owner Daniel Burnell. ►Ice Ribbon(December 11, 2013): Hikaru Shida & Kurumi def Meari Naito & Kaho Kobayashi / Neko Nitta(c) def Miyako Matsumoto & Tsukasa Fujimoto /GAMI & Hamuko Hoshi def Risa Sera & Rutsuko Yamaguchi. ►Kaitlyn def Aksana on WWE's Superstars(December 12, 2013). ►Kasey Ray def Mistress Belmont, Alexxis Nevaeh & Davienne at Chaotic Wrestling's "Pandemonium"(December 13, 2013). ►AJ Lee & Tamina Snuka def The Bella Twins on WWE's Friday Night Smackdown(December 13, 2013). ►SHINE Wrestling's "SHINE 15"(December 13, 2013): Su Yung def Solo Darling/ Leva Bates def Nevaeh/ Sassy Stephie & Jessie Belle def Santana Garrett & Amber O'Neal/ Rain(c) def Amazing Kong/ Ivelisse def Mia Yim/ Jessicka Havok vs Allysin Kay went to double DQ/ Sojo Bolt def La Rosa Negra/ Mercedes Martinez def Heidi Lovelace/ Angelina Love def Taylor Made. ►Kimber Lee def Christina Von Eerie at Combat Zone Wrestling's "Cage Of Death XV"(December 14, 2013). ►Jessica James def Claudia & Angel Blue at Professional Championship Wrestling(December 14, 2013). ►Gatoh Move(December 14, 2013): Emi Sakura & Masa Takanashi def Bonnie & Sayaka Obihiro / Riho & Hiroyo Matsumoto vs Kaori Yoneyama & Kotori went to a time limit draw. ►Starr def Paula Fate at NWA Top Of Texas' "Seasons Beatings"(December 14, 2013). ►Danni Hunter def Viper(c) at FutureShock's "UnderGround 3"(December 14, 2013). ►Fabi Apache, Elegido & Mascarita Sagrada def Taya Valkyrie, Curevo & Mini Abismo at AAA(December 14, 2013). ►Bombshell Ladies Of Wrestling(December 14, 2013): Missy Sampson def La Rosa Negra(c) / Amber Rodriguez def Jennifer Cruz /Jessie Kaye & Sienna Duvall def Angel Dust & Vanity/ Mia Yim & Alexxis Nevaeh def Niya & Hania The Howling Huntress /Grandma Butcher & La Rosa Negra def Annie Social & Sumie Sakai /Jessie Kaye def Sienna Duvall /Mia Yim def Alexxis Nevaeh /La Rosa Negra def Grandma Butcher /La Rosa Negra def Jessie Kaye and Mia Yim. ►Anarchy Championship Wrestling's "Delusions Of Our Childish Days"(December 15, 2013): KC Warfield def Paige Turner /Su Yung(c) def Rhia O'Reilly /Evan Gelistico, Davey Vega, Gary Jay & Pierre Abernathy def Jessica James, Bolt Brady, Jason Silver & Ricky Starks. ►Pro Wrestling WAVE(December 15, 2013): Natsuki Urabe & Ryo Mizunami def Rina Yamashita & Sawako Shimono / AKINO def Mika Iida / Kyusei Sakura Hirota def Kana, Misaki Ohata, Cherry, Mio Shirai, Tsukasa Fujimoto, Hikaru Shida & Fairy Nipponbashi /Ayako Hamada(c) & Yuu Yamagata(c) def GAMI & Tomoka Nakagawa /Yumi Ohka(c) def Shu Shibutani /Ayako Hamada & Yuu Yamagata def Misaki Ohata & Ryu Mizunami. ►JWP's "CLIMAX"(December 15, 2013): Rabbit Miu & Tsukushi def Sachie Abe & KAZUKI/ Hanako Nakamori def Takako Inoue/ Kayoko Haruyama, Command Bolshoi & Yako Fujigasaki def GAMI, Yumi Ohka & Natsuki Urabe/ DASH Chisako & Sendai Sanchiko def Leon & Ray / Arisa Nakajima def Kana(c). ►AJ Lee(c) def Natalya at WWE's TLC(December 15, 2013). ►DIANA(December 15, 2013): Seleziya Sparx def Kaho Kobayashi / Megumi Yabushita def Jenny Rose /Kaoru Ito & Syuri def Yuiga & Hamuko Hoshi /Meiko Satomura def Sareee / Yokota & Manami Toyota def Mima Shimoda & Mask de Sun /Kyoko Inoue & Tomoko Watanabe def Yumiko Hotta(c) & Keiko Aono(c). ►La Malcriada def Aoi Ishibashi at K-DOJO(December 15, 2013). ►Vanessa Kraven def She Nay Nay at SMASH Wrestling(December 15, 2013). ►AJ Lee, Alicia Fox & Tamina Snuka def Natalya & The Bellas on Monday Night RAW(December 16, 2013). ►Estrellita, Goya Kong & Marcela def Dallys la Caribena, La Seductora & Princesa Blanca at CMLL(December 17, 2013). ►AJ Lee def Kaitlyn on WWE's Main Event(December 18, 2013). ►STARDOM on December 23rd: Nanae Takahashi(c) & Miho Wakizawa(c) vs Kyoko Kimura & Act Yasukawa. ►Alternative Wrestling Show's "No More Presents For Christmas" on December 28th: Malia Hosaka vs Kuria Hime/ Candice LeRae vs Christina Von Eerie(c). ►STARDOM on December 29th: Kyoko Kimura(c), Alpha Female(c) & Ayesha Ray(c) vs Mayu Iwatani, Hiroyo Matsumoto & Miho Wakizawa. ►STARDOM's "New Year STARDOM Festival" on January 4th. ►Leicester Championship Wrestling Roses on January 25th: Rhia O'Reilly vs Addy Starr/ Nikki Storm, Kay Lee Ray, Erin Angel, Pollyanna Peppers, Viper, Violet Vendetta, Princess Nadia Sapphire, Shauna Shay, Felony, Jenna, Carmel Jacob. ►Bombshell Ladies Of Wrestling on February 22nd. ►Kana vs Meiko Satomura at KANA Pro on February 25th. ►BellaTrix 8 on March 2nd.